For a change from my normal British diving I travelled to the Maldives to experience some warm water diving. 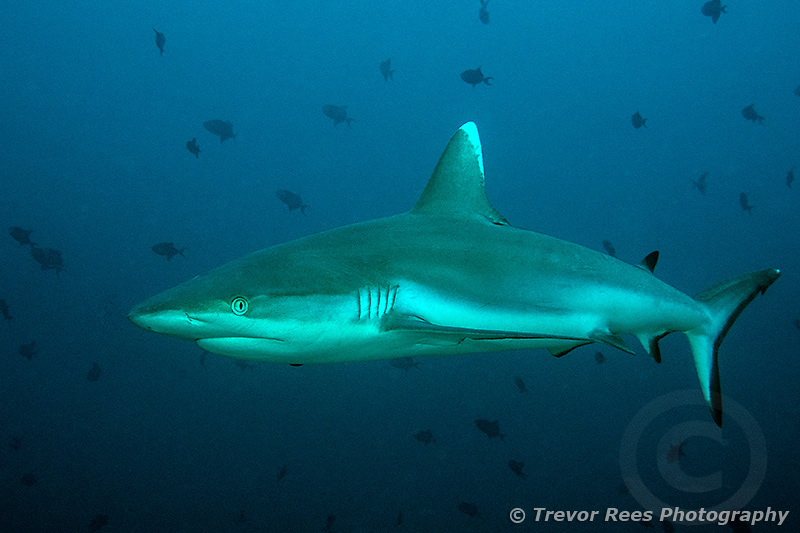 This shot is a grey reef shark (Carcharhinus amblyrhynchos), one of the common sharks to be seen in the Indo-Pacific. This shark was seen at a coral reef drop-off at around 28 metres depth. It is a fast-swimming agile predator that feeds on free-swimming fish. It has the typical reef shark shape, with a broad, round snout and large eyes. It is distinguished from similar species by the white-tipped first dorsal fin, the dark tips on the other fins and the black margin on the tail fin.